But by far the most significant, and the most tragic visit of Nottinghamshire soldiery to Ireland occurred at Eastger 1916 at the time of the Rising when Irish revolutionaries struck for Irish Freedom and the Sherwood Foresters were rushed from their English training depots, to crush rebellion. Over 300 casualties were inflicted upon the Foresters, by less than 20 Irish rebels. No other regiment has ever suffered greater losses in Ireland. The Englishmen who fell were predominately from Nottingham and from Newark, but their fight and their losses have been mostly forgotten in the long and difficult history of the British in Ireland, swept quietly under the sandbags of the Western Front where the horrendous casualty lists were bloody enough to drown out any embarrassment as to what happened in Ireland. 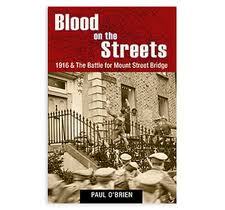 Paul O’Brien’s new book tells their story shot by shot as they lived and died in Dublin. They were supposed to be marching to Trinity College but came across a carefully prepared rebel position on the banks of Dublin’s Royal Canal, just half a mile from their objective. There they were slaughtered in the leafy tree lined suburb with the roadway and canal bank wet with Nottinghamshire blood. The Rebel Commander was none other than Eamon Devalera, a future President of a Free Ireland. He had placed his twenty or so men with great military skill and care as is evidenced by the casualty lists that followed. The men who marched upon him, Nottinghamshire lads of a terribly tender age, were unskilled soldiers most of whom had not yet completed their military training. Incredibly many had not yet fired their weapons on a range, let alone in anger at an enemy, yet here they marched, the very teeth of the British Empire, onto the rebel guns onto their place in Irish History, onto their destiny. They are named here; at last, they are named, there are even photographs so you can look into the eyes of these no longer anonymous men. There is the Nottingham Barrister, the son of a Country Farmer, the Sunday School Teacher from Newark, the lads from the factories and mines and fields, schoolboys really. They had volunteered to fight in France these boys, not Ireland. They were prepared, as all the men of the Great War were, to die for their country in Flanders, but not, for Gods sake! Not in Ireland. The barrister, Dietrishen, was even married to a Dublin girl, he’d sent her, with their infant children, back to Dublin to escape Zeppelin raids on Nottingham. His dear dear wife and his dear dear children, to their eternal joy, saw him, cheered him, waved wildly to him as he marched into Dublin at the head of his beloved Robin Hoods. He was the first to die. This is a graphic and moving story which looks at the battle as much as from the British perspective as from the Irish. Indeed I don’t think there is another Irish book that has ever given so much time to the men of an English Regiment as does this. It treats them with respect, occasionally affection, always as soldiers. It is their testament and if you value the memories of local men, if you wish to know the English history of your town, your people, your nation, your responsibility for what happened and happens in Ireland, then you must read it.